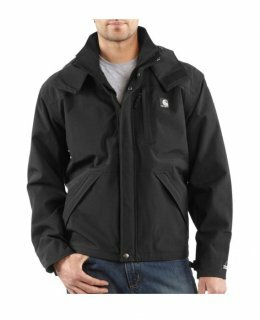 The waterproof breathable jacket is a shorter version of our waterproof breathable coat and is made of durable nylon with a special water-repellent finish. Its breathable membrane allows body heat to leave the garment even as it keeps rain and moisture out. The interior body lining is a 100% polyester mesh, with the sleeves and hood lined in nylon. The contoured three-piece hood features an adjustable draw cord and is removable. The hem is finished with an elastic drawcord to keep out wind and cold.